WHY IS THE ACTIVATION PROCESS IMPORTANT? Activation of different raw materials will yield varying pore structure and size, as well as different surface chemistry and groups. The same raw material activated through different processes will produce carbons that have different properties. Carbon based materials are carbonized (devolatilized) and subsequently further reacted to promote the formation of a pore structure. The distribution of pore sizes, the reactivity, and the surface functional groups create a profile of the particular activated carbon manufactured under a specific set of conditions. Having been created in this manner, this carbon will function optimally in a given application, under given process conditions. WHAT ARE THE MAIN ACTIVATION PROCESSES? The physical activation consists in oxidizing the raw material at high temperatures before the presence of an oxidizing agent, usually steam. This is an endothermic reaction generally requiring between 800 to 1000 °C. The temperature varies depending on the raw material. The chemical activation is based on dehydrating the raw material using chemical substances at an average temperature (400° to 600° C). This temperature depends on the raw material and the chemical substance that is used to activate the carbon. The chemical agents that are generally used are phosphoric acid, zinc chloride and sulfuric acid. 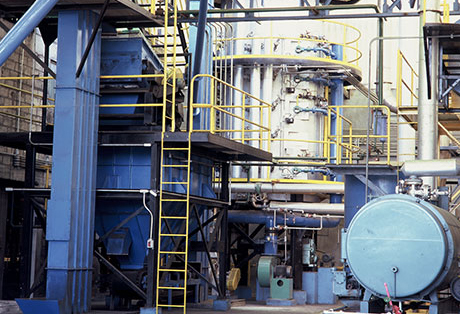 CLARIMEX produces activated carbon for a wide range of applications by means of the two processes using different raw materials. Micropores are pores with a 20 A° (angstroms) diameter or smaller and generally provide a larger area. There are useful to adsorb very tiny molecules, often present in purification of gases, but also useful in removal of trihalomethanes from potable water, as an example in liquid phase. Mesopores range between 20 and 500 A°(angstroms). Although they provide a smaller total area, their size allows them to adsorb larger molecules that are present in the purification of liquids. Macropores do not contribute greatly in the total area of a carbon, but they are important because they act as an access route towards the mesopores and the micropores, thus affecting the speed of diffusion of impurities in the carbon. They are also referred to as transport pores. These indexes indicate how efficiently different size molecules are adsorbed; therefore we can deduce the pore distribution a certain carbon has. It is generally difficult for a carbon to only have one size pores; what it does have is a certain distribution. When the average leans towards the micropores, the carbon is often applicable in “gas phase”; more mesoporous carbons will likely be applied in “liquid phase” applications. Physical Adsorption: caused by Van Der Waals forces. Adsorption in the LIQUID PHASE is the result of equilibrium between adsorption and desorption, consequently, it is a complex phenomenon that can be influence by many variables. There is an empirical equation that is useful to predict the behavior of activated carbon in most of the liquid phase applications. X = amount of adsorbed impurities. 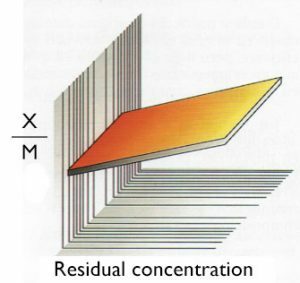 C = residual impurity concentration. If we draw this equation in logarithm paper, we will get a straight line. This graph is known as Freundlich Isotherm and is very useful when evaluating the behavior of activated carbon for a certain application, and to find the appropriate dosage. 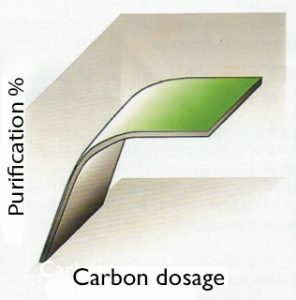 can be noted that there is a range where the efficiency of the activated carbon continually improves, but there comes a point when although more carbon is added, the rate of improvement in removal is reduced. An activated carbon generally adsorbs from 10% to 60% of its weight in impurities. Unfortunately, in the LIQUID PHASE the impurities that have to be removed are usually a mixture of compounds whose precise composition is rarely known. Therefore, producing isotherms is highly important. 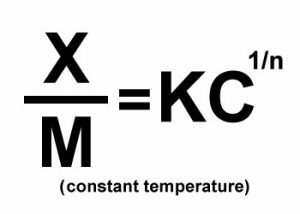 The isotherm will only apply to the same conditions under which it was produced, and by changing any one of the variables, the isotherm may change significantly. For a compound to be adsorbed by the activated carbon, its molecules must penetrate the carbon pores, thus, their diameter must be bigger than the impurity molecules themselves. In LIQUID PHASE most of the molecules are medium size or large, and that they require carbon with a significant mesopores. Considering that adsorption is an equilibrium process, any impurity that has a similarity with the product in which it is present, will make adsorption difficult. For example, a highly soluble pollutant in the medium it is present will be more difficult to adsorb than one with a medium or low solubility. During the adsorption process one of the generally more critical steps is the diffusion of the impurities to be removed towards the external surface of the carbon, consequently any variable that affects diffusivity can also affect adsorption. A higher temperature generally makes reaching equilibrium faster; yet, the amount of adsorbed impurity is lower. That means that if time were not important, more adsorption could be achieved at a lower temperature; rarely practical at an industrial level, so increasing the temperature -when possible- is generally beneficial but needs to be evaluated on a case by case basis. Compounds that generate color are generally highly dependent on the pH, becoming less intense at a lower pH. Adsorption is possibly more efficient at a lower pH. When you are not sure about the behavior, it is better to modify the pH and find an activated carbon with a pH that is close to that of the process. The carbon surface area is largely internal and consequently in most applications the size of the particle does not have an appreciable effect on the adsorption capacity of the carbon itself. Yet, it does affect the velocity to reach the equilibrium. Ash is typically composed of inorganic compounds present in the raw material from which the activated carbon was produced and that did not volatilize during the activation process. The ash content is often correlated to the quality of a carbon. This may be due to purity concerns for soluble ash components, but at the same time, ash can play a positive role in adsorption in certain applications. There are many applications in which ash is not important; nevertheless, there are some processes in which the presence of inorganic compounds, for example, calcium, magnesium, and iron can cause an unwanted reaction. There are two ways of using activated carbon during the LIQUID PHASE. Using powdered activated carbon or granular activated carbon. Both carbons have specific characteristics that make them more or less convenient for a specific case. Selecting one of them also means selecting the way it will be applied. As mentioned before, the only difference between a granular and a powdered carbon is the size of the particle. Accordingly, the time needed to get the same result is much longer when using granular carbon packed in a column through which the liquid flows. This kind of operation is advisable for continuous processes to achieve a stable quality of the liquor that is being purified and when working with large flows. It has an advantage; the carbon can be regenerated and therefore the consumption is lower; but the needed investment is high and is not always justified. The column operation has the same principle as the countercurrent contact; moreover, it could be considered a multiple stage contact. Between the influent and the effluent, there is an impurity concentration gradient and the incoming carbon is exhausted faster that the outgoing carbon. Size of the carbon particle; the smallest carbon gives smaller MTZ’s, but a higher-pressure drop. Temperature; due to the reduction of viscosity, an increase in temperature generally reduces the MTZ height. 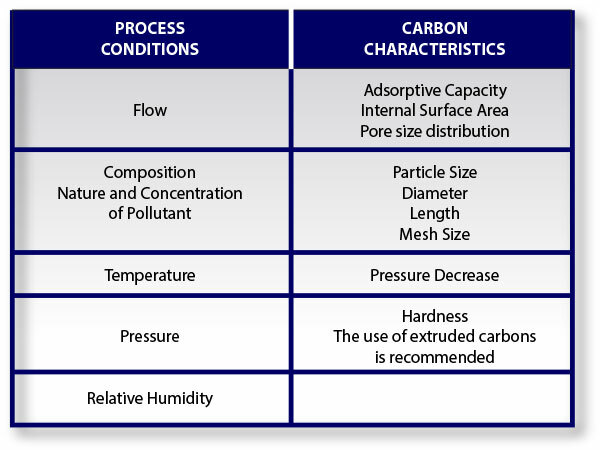 Characteristics of the carbon being used (pore size) and of the product that is being purified (diffusion coefficient). It should be emphasized that the capacity of a Granular Carbon is the same as that of a Powdered Carbon, the way to determine the easiness to adsorb a certain impurity is grinding the carbon and running Freundlich Isotherms in the laboratory. In order to get the design parameters for a column (diameter, carbon height, flow, etc.) a pilot test must be carried out. A simple way to do so is using several 3.5” or 4″ columns in a series. Pulse bed systems operate in upflow mode and part of the carbon is extracted periodically. Such is replaced by virgin or regenerated carbon through the top of the column. The liquor must be free of any suspended solids. If there are any, the carbon bed will act as a filter and create pressure. The flow must be accurately controlled. If there are any important variations, the carbon bed might liquefy and the liquor might drag some carbon. This system operates in downflow, the carbon slowly is spent from top to bottom and when the outgoing concentration is higher than the allowed maximum, the column is no longer operated and the carbon is replaced. This arrangement is less efficient because when the column is no longer operated, part of the carbon still has a certain degree of activity, yet, it is more versatile. In the event the liquor had suspended solids that were caught by the carbon bed, the operation is stopped and it is backwashed to remove the solids to waste. In addition, if the flow increases considerably there would be no difficulties. A variation for this arrangement to render it more efficient and to better exhaust the existing carbon is to use two columns in a series. When the first column is exhausted, No. 2 column becomes No. 1, and a recently regenerated column enters the system as column No. 2. In the fixed bed systems, it is always necessary to have an empty 40 – 50% space. Such space must be available to backwash the carbon bed. When backwashing, a flow that allows from 20% to 30% bed expansion must be used. When using powdered carbon, this is added to the product that is being purified in a tank that has enough agitation in order to get an homogeneous suspension. After adequate contact time, the carbon is removed either by sedimentation or filtration. When possible, it is recommended to have a small mix tank where the activated carbon suspension is prepared -with water or with a clean liquid- and the powder is allowed to wet efficiently. The suspension is later added to the treatment tank. The powdered carbon operation is more versatile because the dosage can be modified depending on the quality of the liquid that is being purified, so reducing variations in the process. In addition, the equipment needed is very simple and conventional, therefore the required investment is low. The dosage range can be determined by using Freundlich isotherms described before. In general, the carbon dosage in most of the applications is lower than 2%. Sometimes, the isotherm for a certain application shows a steep slope that indicates that a high dosage of activated carbon is needed to achieve high purification levels. Such being the case, to improve the use of the carbon and to reduce its dosage, the double countercurrent contact is a good option. This process consists in a first treatment with activated carbon that has been through the process once. Then, the liquor obtained is treated again, but now with virgin carbon. The final liquor would have a better quality than the one that only had one contact. The carbon that is collected from this second filtration is precisely the one that is used again for the first treatment. The result of the double contact means important savings of carbon of 50% or more. Yet, before making a decision, the need for more equipment and more labor must be considered. 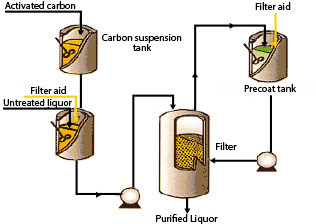 An approximation to double contact is achieved by taking one of the filters used to filtering liquor with carbon, and instead of throwing away the cake and washing it, use it to filter the untreated liquor before sending it to the carbon treatment tanks. This double contact, although not as efficient as the one mentioned above, requires less additional equipment. Activated carbons for applications in the gaseous phase are mainly used for the purification of air, purification of process gases, recuperation of solvents, protection of the environment and as a catalyst. The nature and the concentration of the pollutant, together with the specific conditions of the process determine the kind of carbon to be used. Generally, because the size of the vapor molecules is relatively small, microporous carbons are required. In some applications, carbon activity is improved by impregnating it with catalysts or chemisorbates. 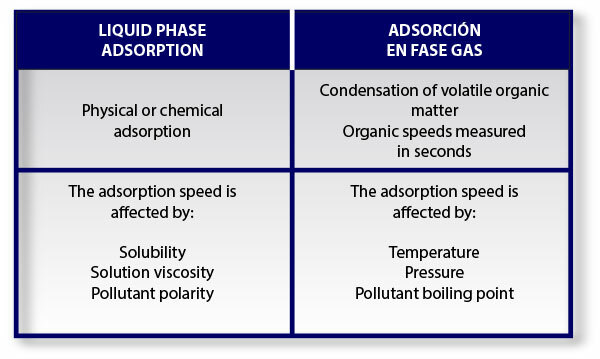 Adsorption in the gaseous phase is carried out by means of vapor condensation as the result of the interaction between the surface of the carbon and the vaporis an exothermal reaction. The adsorption process in the gaseous phase can be described by means of special empirical equations such as the BET theory or the DUBININ equations. The DUBININ equation relates the balanced adsorption capacity for a certain type of carbon at a determined temperature to the existing vapor concentration in the gas current that must be purified. Only when the vapor current to be treated is fully saturated will all the carbon pores be filled with the adsorbate. When the adsorbate concentration is at its lowest, only the smallest micropores will have the sufficient adsorption energy to adsorb it. As the temperature rises, the energy content increases, therefore, the adsorbent requires more energy to remain in a liquid state, thus directly affecting the adsorption balance. As the temperature rises, the vapor pressure increases making it more difficult to keep the adsorbent in its liquid state. As the temperature rises, the density of the adsorbent decreases. The more complex the adsorbate mixture to be treated is, the more easily it will be adsorbed. When the adsorbate has a low boiling point, a higher degree of carbon activity is required. High relative humidity leads to a high humidity content in the carbon, thus strongly inhibiting its adsorption capacity. Activated carbon is especially effective to adsorb impurities present at a ppm concentration. At these levels any other technique is generally more expensive. Activated carbon can adsorb almost any organic compound. Impurities with higher boiling points, are more easily adsorbed with activated carbon. If the impurity has a low boiling point, an impregnated carbon can be used to improve the efficiency. Removal of sulfuric compounds such as:H2S metacaptanes and other present in CO2, H2, CH4 and N2 flows. Removal of traces of mercury vapor present in gaseous fuels. In general, a few seconds are enough in all these applications to achieve adsorption. When purifying air, activated carbon is usually the most efficient method to control dangerous emissions or offensive odors coming from a number of industries, mainly applicable when the pollutant is present in a maximum concentration of hundreds of ppm. As in the previous case, the higher the boiling point the impurity has, the more efficient the adsorption will be. Depending on the removal efficiency required, the necessary contact time might be of a fraction of a second. The air flow may vary between 0.05 and 0.4 m/sec; a common value is 0.25 m/sec. In the first stage, the gas and solvent current goes through a carbon bed. The carbon adsorbs the vapor until it becomes saturated. 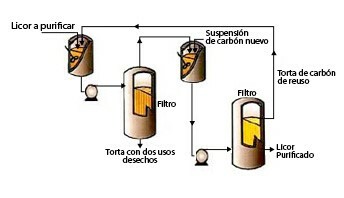 In the second stage, the adsorbent is removed from the operation and is subjected to a desorption process in which a low pressure steam or a hot inert gas current passes through the carbon bed. Once the desorption cycle has been completed the adsorbent begins operating again. The solvent is recovered from the condensates or the inert gas applying the appropriate technique. The use of the lowest temperature possible (less than 50°C), and a relative air humidity lower than 70% (the lower the better) are recommended for this type of application. Contact time varies between 2 and 4 seconds, and the depth of the carbon bed between 50 and 150 cms. Industrial masks and breathers used as protection against toxic gases. As a catalyst or catalyst support, for example in the “MEROX” process for sweetening gasoline. The use of granular or pelletized activated carbons that provide a high level of hardness, and the appropriate flow behavior is recommended together with the fall in pressure. Carbons for the gaseous phase are characterized by the fact that they have a great number of micropores. As mentioned before, the factors that affect the length of the mass transfer zone and the fall in pressure, in the liquid phase, also apply in the case of the gaseous phase; nevertheless, there are additional factors that must be considered when designing a gaseous phase system, such as relative humidity. Consequently, it is convenient to assess the process by performing a test and also by getting in touch with your CLARIMEX specialist. Many years ago the egyptians discovered that wood carbon could be used to purify other products and could even be used as medicine. At present, activated carbon is used to remove color, smell and taste from a great number of products, therefore we can find simple applications that range from aquariums and refrigerator filters, to complex industrial systems as wastewater treatment plants or precise systems to produce antibiotics. WHAT MAKES ACTIVATED CARBON SUCH A VERSATILE MATERIAL? First, the adsorption process should be analyzed to better understand how activated carbon works. Adsorption is a process by which the atoms on the surface of a solid attract and retain molecules from other compounds. These attraction forces are known as the “Van Der Waals” forces. Therefore, due to the fact that this phenomenon only takes place on the surface, the larger the available surface a solid has, the more adsorbent it will be. Activated carbon is a product that has a reticular crystalline structure similar to that of graphite. It is extremely porous and can develop a 1,800 m2 surface area or bigger per gram of carbon. All the carbon atoms on the surface of a crystal can attract molecules of those compounds that produce an unwanted color, smell or taste. What establishes the difference when considering activated carbon is the amount of atoms available on the surface that carry out the adsorption process. That is to say, the activation of any carbon consists in “multiplying” the surface area creating a porous structure. 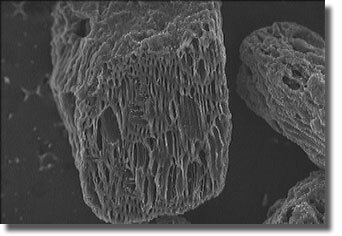 It should be mentioned that the activated carbon surface area is internal. To better understand how large it is, let us imagine a piece of carbon weighing one gram. Now, let us grind that piece very finely to increase its surface; we will get an approximate 3 to 4 m2 area. When we activate carbon we can multiply that value from 200 to 450 times. Therefore, when you want to remove organic impurities that cause color, odor or undesirable taste, usually activated carbon adsorption the most economical and simple technique.